During the past four months, Dave Dinges has become quite familiar with the daily operations of the Cedar Street Red Cross Homeless Shelter and the vital role it plays in the community. Dinges oversaw the completion of a 1,550-square-foot addition, which included a new heating and air-conditioning system, a larger dining and activity room, an area to prepare food, and plenty of storage space for donated clothing and supplies. More importantly, the former dining room was remodeled and has been designated to serve entire families, something Red Cross officials say they are encountering more of on a daily basis. The shelter office also was expanded and equipped with new computers, filing cabinets and a one-on-one case management room. However, Pat Ambrose, the shelter’s service coordinator, said she was most appreciative of the extra work provided by Dinges and his 16-year-old son, Eric. When Dinges wasn’t on-site, he was in the community gathering thousands of dollars in donations, such as benches from Spider Manufacturing. The metal seats were installed in a newly created and heated waiting room. He also gathered office furniture from Michaelsen Office Furniture in Machesney Park. His son spent part of his Christmas break also in the community gathering donations from area businesses collecting 20 Rubbermaid large plastic tubs, most of which were filled with new bed linen, new socks and hats. Richard Wooten, 42, and his fiancee, Kira Rhodes, and their 11-month-old daughter, Ameliana, have lived at the 48-bed shelter off and on for several months. They said the expansion couldn’t have come at a better time. “It’s not congested in here now,” Wooten said. Since its opening in 1995, the shelter has housed more than 6,600 individuals, and more than 1,500 people have found permanent housing with assistance from the Rock River Chapter of the American Red Cross. SCOTT MORGAN | RRSTAR.COM Kira Rhodes and Richard Wooten stand with their 11-month-old daughter, Ameliana Rhodes-Wooten, in a family area where Rhodes and her daughter have been staying Tuesday, Dec. 30, 2008, at the Red Cross Homeless Shelter in Rockford. The shelter recently completed a $330,000 addition, which includes a larger dining area. The old dining area has been divided into three family rooms. The shelter policy is for men to sleep in the men's area, even if they are in the shelter with their family. SCOTT MORGAN | RRSTAR.COM Eric Dinges (right), 16, and his father, Dave Dinges, stand in a new storage room Tuesday, Dec. 30, 2008, at the Red Cross Homeless Shelter in Rockford. The shelter recently completed a $330,000 addition, which includes a larger dining area. The old dining area has been divided into three family rooms. Eric volunteered to solicit donations to the Red Cross by asking local businesses to contribute. SCOTT MORGAN | RRSTAR.COM A new dining area Tuesday, Dec. 30, 2008, at the Red Cross Homeless Shelter in Rockford. The shelter recently completed a $330,000 addition, which includes the larger dining area. The old dining area has been divided into three family rooms. Anderson Packaging Doubles Holiday Fundraising Goal – American Red Cross Rock River Chapter Emergency Overnight Shelter received $11,000! Rock River Chapter is one of four agencies to receive funds garnered through employee fundraiser – the American Red Cross Rock River Chapter Emergency Overnight Shelter received $11,000! The Rock River Chapter of the American Red Cross is pleased to announce a generous holiday gift from Anderson Packaging. 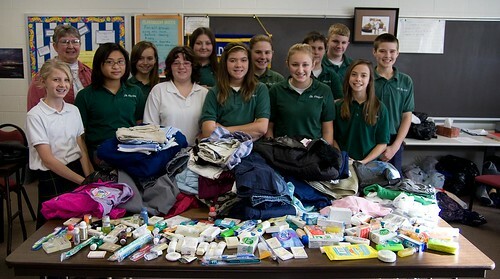 This donation comes as a result of Anderson’s second annual Project E.L.L.F. charitable giving campaign. The program, “Project E.L.L.F. : Enriching the Lives of the Less Fortunate”, was designed as a grassroots holiday themed voluntary charity donation effort for company workers. Over a three-week period, from December 1st to December 17th, workers submitted donations to nominate teams in a cross-functional competition. Teams raising the most money will greet workers at the plant entrances today in holiday themed costumes at each of the company’s three shifts and multiple facilities. “Going into this year’s campaign we established a goal of $10,000 for employee contributions,” states Tracy Barr, Director of Customer Project Planning at Anderson Packaging. “Despite the very challenging economy, we were astonished to find that we were able to raise $22,000 in employee contributions. It’s truly a testament to our employee’s generosity and sense of community.” With a 100% match from the company, the final tally is $44,000. To meet the temporary shelter needs of a diverse group of individuals who for whatever cause are homeless in the community. We strive to create a safe environment that is free of discrimination and respects human dignity. This will be accomplished by providing positive role models, community education, and support systems which empower and develop guests, volunteers and staff, with a focus on long-term solutions. Anderson Packaging, a wholly owned subsidiary of the AmerisourceBergen Corporation, is one of the fastest growing pharmaceutical contract packagers in the United States. With extensive experience in new-product launches and process startup, Anderson offers specialized services such as package development, including design of child-resistant and patient compliance prompting features, as well as process development, including in-house tooling design and manufacture. Anderson also maintains one of the most progressive process, facilities and validation programs in the contract packaging industry, while maintaining a record of superior quality and service. The recent bitter cold weather is causing many homeless shelters to be filled to capacity. The poor economy was already giving local shelters too much business. But now with this arctic cold weather the last few days, many are scrambling to find enough room for the homeless. If you’d like to find out how you can help local homeless shelters by making a donation you can call the American Red Cross at 815-963-8471 or www.rockriver.redcross.org.